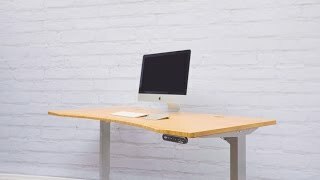 Increase space to hang your under-desk accessories and connect your desk's crossbars with the UPLIFT Desk Crossbar Center Rail. Two crossbar ends on UPLIFT 2-leg or 3-leg desks intersect by way of this rail, giving you a secure spot upon which to hang your accessories, like CPU holders and keyboard trays. If you need a replacement rail, you can order the center rail solo. Note: The crossbar center rail is optional on 2-leg desks. What is a Crossbar Center Rail, and why do I need one? If you like to maximize space at your workstation, a crossbar center rail can help you fit more accessories under your desktop, such as CPU Holders or Keyboard Trays. UPLIFT Desk Center Crossbar Rails are constructed out of sturdy steel, so you can rest assured you'll get a reliable rail to hold all of your under-desk accessories with a single desk addition. Will this work on 2-leg or 3-leg desks? Our Center Crossbar Rails are compatible with our 2-leg and 3-leg desks. Although it is optional on 2-leg desks, it is necessary for 3-leg desks for stability. UPLIFT Desk frames come in a trio of colors: black, gray, and white.